Wikileaks did it again — proving beyond the frailest shadow of a doubt fork-tongued mainstream presstitutes have no interest in legitimate reporting — but would rather spoon feed the American populace whatever mendacious drivel suits their corporate sponsors’ slavishly nationalist, Russophobic agenda. Facts be damned. Oldstream media tried to hold Wikileaks accountable for yet another exploit for which it had literally no role. Where the civilians of this once-united nation vociferously defend their preferred mainstream outlet-du-jour for being less slanted than its political polar opposite — as in, how MSNBC could be considered the left’s answer to FOX News — one former titan of bias-free reporting just proved itself no different than a random grocery store tabloid. Parting with an ostensively factual, if admittedly left-inclined, record of award-winning journalism, NPR — taxpayer-funded, U.S. government-approved, National Public Radio — spun the brazen anti-free press, establishment-friendly narrative into a tweet so poorly vetted, Twitter briefly raised a single collective eyebrow. That is, before users from around the globe attacked normally mild-mannered NPR with that special scorn only Twitter can muster — because the public outlet threw journalistic integrity to the wayside — in reporting documents pertaining to now newly-elected French President Emmanuel Macron. 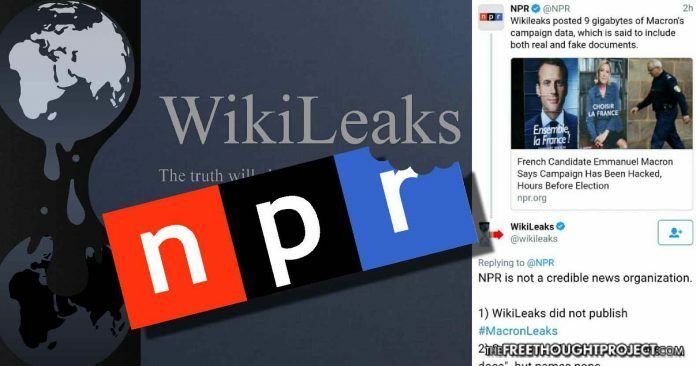 “Wikileaks posted 9 gigabytes of Macron’s campaign data, which is said to include both real and fake documents,” the verified NPR account flippantly tweeted with a link to its own article about the leak on Saturday afternoon. Mais bien sûr, Wikileaks had nothing whatsoever to do with the massive cache of documents being leaked online, no matter how ecstatic the apparent hack staff manning the NPR Twitter account would have been. “NPR is not a credible news organization. @NPR NPR is not a credible news organization. Worse, though the taxpayer-funded media outlet did indeed retract its statement, albeit without actually issuing an official retraction, NPR still struggled with the facts. With the top of its article now emblazoned with a bold-type notice of update, the actual correction — buried at the very end of its Macron article — somehow veered miles from the truth. Again. No dice. That half-hearted correction still stands today, as is. What actually happened lacked the simplicity of a package adroitly and fastidiously wrapped — and that an anonymous 4chan user posted the voluminous leak to a popular board, sans fanfare, made the potentially earth-shaking cache a bit closer to an oddly shaped, Sunday comics-sporting holiday gift, care of that third cousin you know by name, but have never bothered meeting face to face. NPR sought, with its underhanded but nakedly accusatory tweet, to, well, wrap up the case of an unknown leaker — perhaps hell bent on gifting far-right candidate, Marine Le Pen, the election — with a pretty bow. But as truth is wont to be, The New Yorker divined the actual facts of the situation, and interviewed the man who, in haste, tweeted a link to the 4chan post without so much as verifying or examining the thousands of documents it contained. Within hours, Pobosiec’s tweet commanded the attention of much of France, and earned a fat banner on the wildly popular Drudge Report; though the indie journalist — ensconced in festivities at Cinco de Milo, an event held by fellow anti-globalist reporter, Milo Yiannopoulos — had been none the wiser of the attention until after midnight Friday. Drab details of Pobosiec’s unintentional instant fame aside, the Canadian correspondent for Rebel clearly had no association with Wikileaks, much less the shadowy figure responsible for posting the leak to 4chan. Even less so, the contents of the future French president’s private emails and documents — almost instantaneously derided as at least partly fake by Macron’s campaign, mere hours before that nation’s mandatory press blackout two days prior to an election of any information with the potential to sway the vote. So, why — amid an ongoing propaganda campaign attempting to discredit alternative and mainstream media, alike, via the label Fake News — would NPR stray so far from the path of integrity in journalism, it would need a saw-edged machete to find its way back to the light? Clarification: NPR cannot confirm who originally uploaded the leaked documents to the Internet. Twitter was not amused — nor had it been from the moment Wikileaks unfairly shouldered the blame — to an audience of some seven million followers of NPR. @NPR @wikileaks That was not a problem with clarity. That was straight up misinformation. @NPR What is your basis for attribution to Wikileaks? @NPR You call yourselves journalists? @NPR Crickey NPR, I usually think the world of u. Do better research. #Macronleaks weren't released by Wikileaks. This is embarassing 4 u. Although a sizeable percentage of the American public has forsaken ailing mainstream media, like NPR, for alternatives in independent media, the peddling of blatantly fabricated information — whether calculated or hapless — set the stage for an all-out battle between journalism and government-approved propaganda. That outlets like NPR, the Washington Post, and New York Times have faced intense scrutiny amid the Fake News wars for shameful attempts to manipulate public opinion in favor of the political establishment does not assuage those outlets’ foray into work ordinarily reserved for the U.S. Intelligence Community. In fact, the nonchalance with which NPR tweeted a heinous lie evinces precisely why the public no longer puts any faith in reporting by once-illustrious outlets which now function more aptly as State mouthpieces. Fortunately for Wikileaks and media organizations not beholden to a political or corporate agenda, that distrust has effectively rendered mainstream media moot. This corpse of its former glory — cold, unfeeling, and lacking basic fact-checking skills — is every bit as useless at being a trusted mainstay of journalism it could once proudly claim.